Coffee may be an important part of your morning routine, but how much do you really know about it? We’re here to help shed some light on the most common terms you’ll find on our website or hear in our café. Let’s talk coffee! Acidic (or Acidy) – Describes a coffee that is felt particularly on the back sides of the tongue. Americano – A shot of espresso diluted with hot water. Aromatic – Describes coffee that has a very noticeable scent. Baked – Describes coffee that is dull or flat. Barista – The person who prepares coffee at a coffee bar. Big – Describes coffee with a full to heavy body. Biting – Describes coffee that is high in acid content. Bitter (or Sour) – Bitter coffee tastes sour usually because it has been cooked or brought to a high temperature after brew. Body – Starts with a light “thin” mouthfeel and progresses to a full-bodied, “heavy” mouthfeel. Burnt – Describes coffee, mostly dark roasts, that has a charred, often bitter taste. Cappuccino – An espresso shot combined with foamed steamed milk. Chemex – The classic hourglass-shaped filter coffee brewer. Chemex filters are denser than other paper filters and are believed to create a sweeter, well-balanced cup of coffee. Creamy – This is a characteristic of coffee, usually pressure brewed, with acidity that is cut by its own natural sugars. This does not mean that the coffee has cream in it. Crema – Thick, caramel-colored emulsified oils that sit on top of an espresso. Cupping – Tasting method used by coffee professionals. Coarsely ground coffee is steeped with hot water in shallow bowls, then slurped from flat spoons. Dark Roast – Coffee beans roasted until they exude oils. Deep (or Complex) – Describes a flavorful coffee that contains many taste characteristics with a pleasant, rich aftertaste. Drip Coffee – Coffee made with a filter, a press pot, a percolator or a countertop coffee maker. Flavor is extracted by contact with water not under pressure. Dry – As in wine, a dry coffee is one that is not sweet. Espresso – Concentrated coffee made when hot water is forced at pressure through fine coffee grounds. Even – Describes a smooth coffee that has no one flavor attribute that outdoes the others. 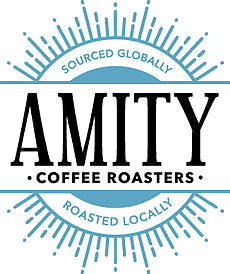 Extraction – Drawing flavor from coffee grounds. Coffee can be under-extracted and taste sour or over-extracted and taste bitter. Filter Coffee – Drip coffee made with a ceramic, glass or plastic cone lined with a paper filter. French Press (or Press Pot) – Coffee made by steeping grounds with hot water in a vessel with a plunger and metal filter that pushes the grounds to the bottom. Fruity – Not to be confused with “sweet,” this term describes coffee beans that have snappy, berry-like notes. Full – Describes a coffee whose body is almost heavy, but not overwhelmingly so. Full-bodied coffees are satisfying and pleasant. Green Beans – Unroasted coffee beans. Heavy – Describes a coffee whose body is dense or weighty in the mouth. Medium – Describes the flavor of a coffee that is neither mild nor rich. Mild – Describes a coffee with the least strong of flavors. Mouthfeel – Describes how heavy or dense the coffee is on the tongue; a measure of body. Peaberry – A coffee berry containing one rounded seed instead of the usual two. Such beans are esteemed for their fine, strong flavor. Rich – Describes a coffee that has a full body and deep flavor traits. Roast – Unpalatable green beans are heated to create complex flavors that are extracted during brewing. Roast Date – Most small-batch roasters print the roast date on bags of coffee. The rule of thumb is that coffee should be used within two weeks, and some coffee bars won’t sell beans more than a week after they have been roasted. Roasty – Usually describes dark-roasted coffees with a strong flavor. Robust – Describes a coffee that is “big” or very full bodied. Single Origin – Coffee from a particular region, farm or area within a farm. Slow Dripper – Unusual devices imported from Japan with a glass sphere and a series of tubes and valves that make coffee with cold water in about 12 hours. Smoky – Not to be confused with “burnt,” smoky is often a positive attribute of coffee that has a woody flavor. Smooth – Describes a coffee that is neither bitter nor sour. Yet its positive characteristics are not overwhelming either. Smooth coffees are generally not terribly complex. Snappy – Describes coffee with a distinct but not unpleasant “zing” that hits the back-top or middle of the tongue. Spicy – Describes coffees that appear to have the presence of spice in them. Sweet – This characteristic describes unadulterated coffees that have a naturally sweet characteristic. Tart – Describes a sharply bitter, stale-tasting coffee. Thin – Describes a coffee whose body is lackluster and watery but not necessarily weak in flavor. Watery – Describes a coffee that has a very weak body and little flavor. Weak – Describes a coffee that has a very faint flavor and often little body.